So just yesterday we saw that Samsung’s upcoming GT-I9300 may arrive with an eye tracking feature and we were wondering how the company would implement this and today we find out that Samsung has already tried to implement a tiny bit of it in its yesterday’s release of the ‘Value-Pack’ for the Galaxy S.
With the Value Pack, Samsung added the ‘Face Unlock’ feature to the first generation of the Galaxy S. But since its introduction, the Face Unlock feature was found out to be easily fooled. The device was able to be unlocked just by placing the picture of person. 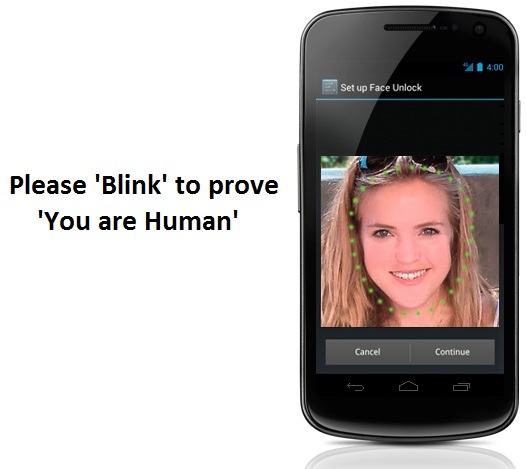 So now your phone will only unlock if you blink. Your smartphone will not unlock until you prove to it that you are a human being. Indeed a very interesting implementation by Samsung. And so this blinking feature gives a highlight as to what Samsung may be having in store for us with the eye-tracking feature.